The timetable of Metro trains is available online and can be downloaded from the L&T website. Hyderabad: The timetable of Metro trains is available online and can be downloaded from the L&T website. However, it is a static word document with no real-time information. Several requests have been made by commuters for updated timings, both offline and on Twitter. A commuter, Krishna Chaitanya, wrote on Twitter, “At Ameerpet, metro station shutters were closed on the Maitrivanam side at 10:20 pm. It made us think the Metro trains operate only till 10 pm. So we left for Habsiguda in a cab. On the way we realised that Metro service is on even after 10 pm. We felt inconvenience because of the unavailability of time table, not even in T-Savari or HMR site (sic)”. The authorities have put up flexis of the timetable at several points at Metro station, including the concourse and platform level. Commuters can get the real-time updates on the T-Savari app. 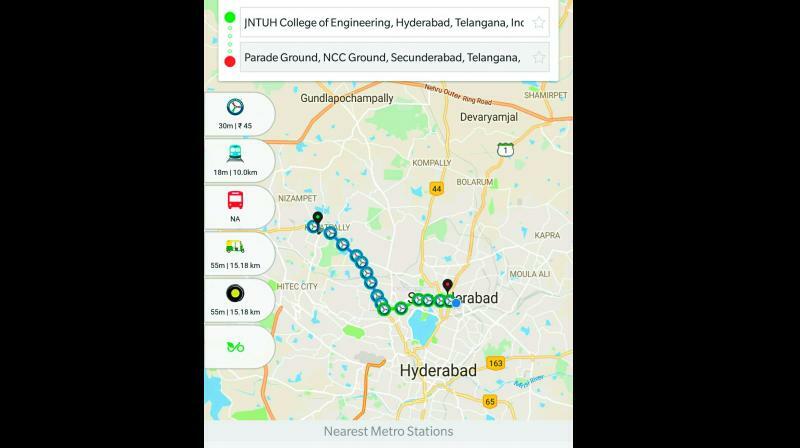 They can get not just timings of Metro but also those of MMTS and APSRTC buses on the app. It also provides information about the best possible route and the nearest station based on the location available. The app suggests which bus, train or MMTS to board based on the current location and destination. Other options include booking an Ola auto or cab and even a bicycle option soon. Electronic displays at the Metro stations which display the platform number and the destination will soon begin displaying timings too.